That’s right. Cheese. 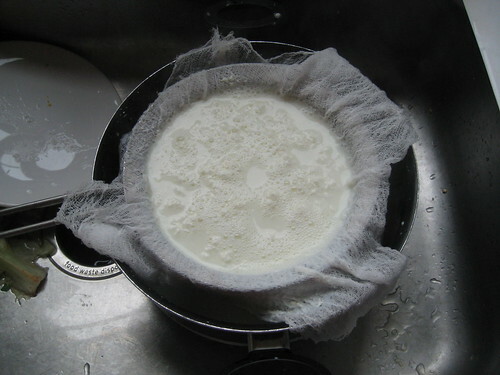 I was surprised by how easy it was.Â It was just a simple farmer’s cheese, but still.Â Making cheese is one of those things you just assume is impossible; for professionals only.Â Turns out people have been making it for a long time, with tools far cruder than what we have today.Â Who knew? This could probably be an Instructable, but I’m not an expert, and I’d hate to inadvertently lead someone astray.Â This is what worked for me, your results may vary. So let’s get down to it.Â I used this recipe / procedure.Â Other than grossly over-specifying the amount of salt needed, it was easy to follow and gave good results. 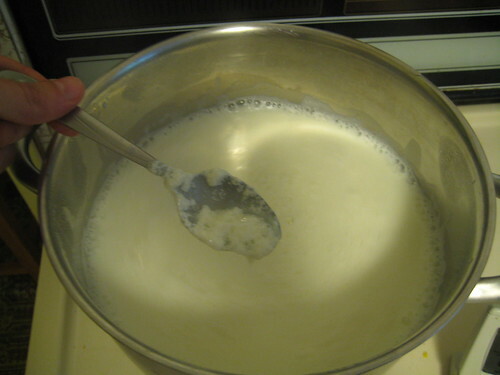 Once the milk was at temperature, buttermilk and vinegar were added. 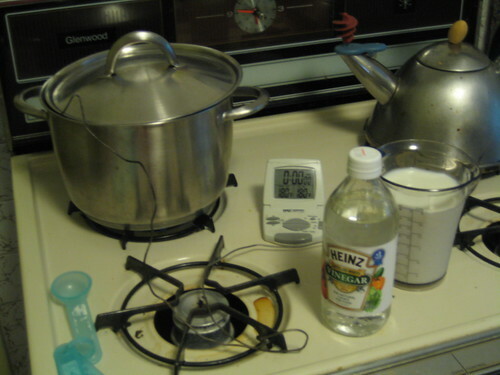 Lowering the pH of the system causes the solids in the milk to want to separate. I think. This will happen at any temperature, but it’s amazing how quickly it starts when you’re at 180 degrees. 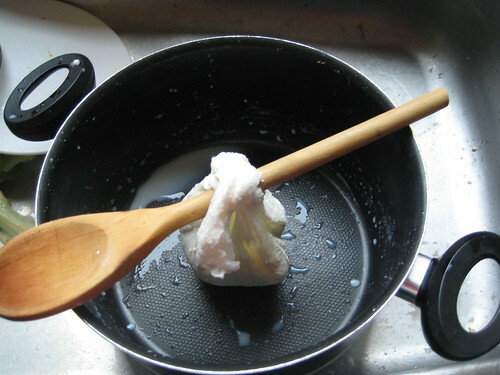 After about 10 minutes, it’s assumed that all the solids that are going to curdle have curdled. Time to get them out of there! 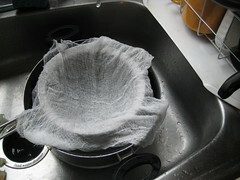 Using cheese cloth and a strainer (for support,) I was able to keep the curds and dump the whey. Yes. 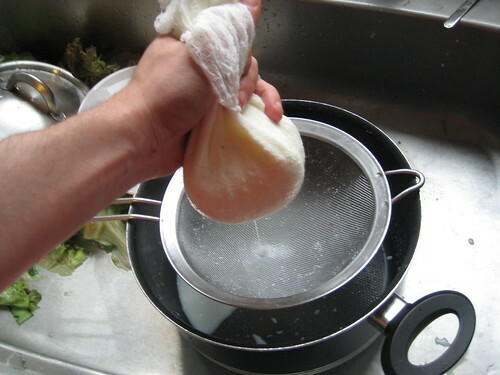 Curds and whey. This is where that comes from. Why Miss Muffet would want to eat whey is beyond me. 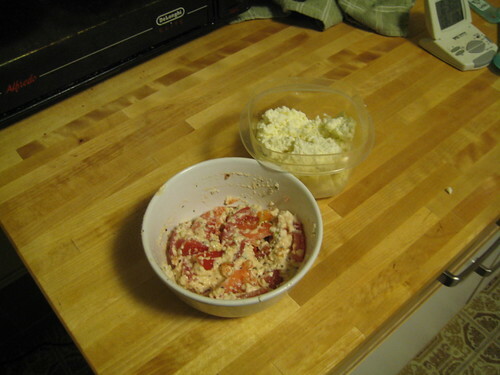 The curds are tasty though. 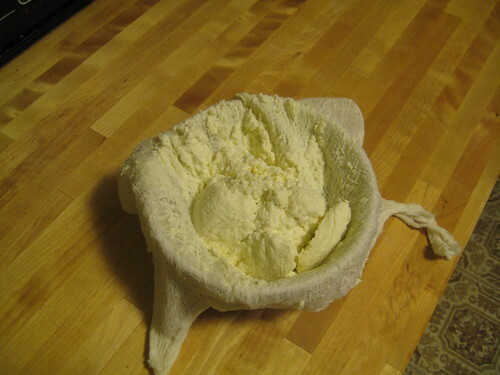 The next step for me is to make “real” cheese.Â That means renet, and aging. At least I think that’s what it means.